U.S. stocks turned higher, extending a recent upswing after Federal Reserve Chairman Jerome Powell indicated the U.S. central bank wouldn’t move too quickly in changing monetary policy, and that it would be flexible in the face of changing conditions. He mentioned as well that the central bank would continue raising benchmark rates due the health of the economy. Traders also digested the latest round of corporate earnings, which came in mixed. Dow closed up 0.2% at 25119, marking its 4th straight positive finish in a row. The Dow Jones Index closed at 25119 level. More upside is likely once price breaks above the triangle pattern. 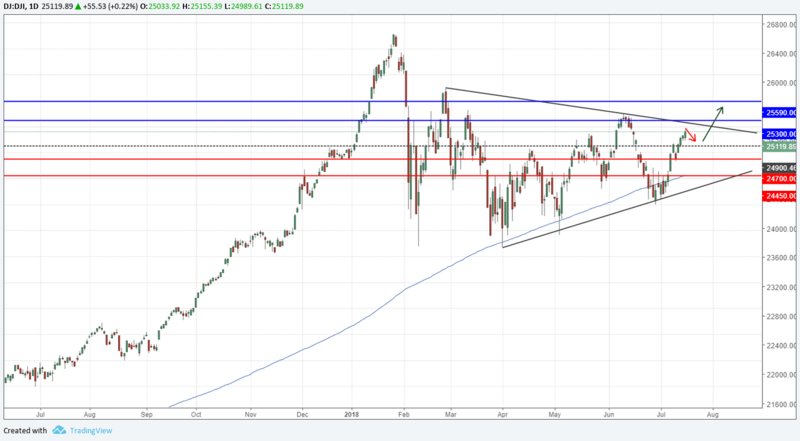 A bullish breakout above the resistance trend line at 25300 would confirm a potential uptrend continuation and possibly establish new quarter highs. On the flip side, if the index fails to break the trendline it would form a lower high and pullback towards 24800.